For other uses, see Visa (disambiguation). Visa Inc. (pronunciation: /ˈviːzə/ or /viːsə/; NYSE: V) is an American multinational financial services corporation headquartered on 595 Market Street, Financial District in San Francisco, California, United States, although much of the company's staff is based in Foster City, California. It facilitates electronic funds transfers throughout the world, most commonly through Visa-branded credit card and debit cards. Visa does not issue cards, extend credit or set rates and fees for consumers; rather, Visa provides financial institutions with Visa-branded payment products that they then use to offer credit, debit, prepaid and cash-access programs to their customers. In 2008, according to The Nilson Report, Visa held a 38.3% market share of the credit card marketplace and 60.7% of the debit card marketplace in the United States. In 2009, Visa’s global network (known as VisaNet) processed 62 billion transactions with a total volume of $4.4 trillion. Visa has operations across Asia-Pacific, North America, Central and South America, the Caribbean, Western Europe, Central and Eastern Europe, Africa and Middle East. Visa Europe is a separate membership entity that is an exclusive licensee of Visa Inc.'s trademarks and technology in the European region, issuing cards such as Visa Debit. A 1976 ad promoting the change of name to Visa. 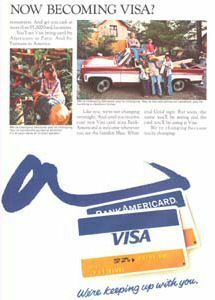 Note the early Visa card shown in the ad, as well as the image of the BankAmericard that it replaced. In mid-September 1958, Bank of America (BofA) launched its BankAmericard credit card program in Fresno, California, with an initial mailing of 60,000 unsolicited credit cards. The original idea was the brainchild of BofA's in-house product development think tank, the Customer Services Research Group, and its leader, Joseph P. Williams. Williams convinced senior BofA executives in 1956 to let him pursue what became the world's first successful credit card "drop", or mass mailing of unsolicited credit cards (that is actual working cards, not mere applications) to a large population. Williams' accomplishment was in the successful implementation of the all-purpose credit card, not in coming up with the idea. By the mid-1950s, the typical middle-class American already maintained revolving credit accounts with several different merchants, which was clearly inefficient and inconvenient due to the need to carry so many cards and pay so many separate bills each month. The need for a unified financial instrument was already palpably obvious to the American financial services industry, but no one could figure out how to do it. There were already charge cards like Diners Club (which had to be paid in full at the end of each billing cycle), and "by the mid-1950s, there had been at least a dozen attempts to create an all-purpose credit card." However, these prior attempts had been carried out by small banks which lacked the resources to make them work. Williams and his team studied these failures carefully and believed they could avoid replicating those banks' mistakes; they also studied existing revolving credit operations at Sears and Mobil Oil to learn why they were successful. Fresno was selected for its population of 250,000 (big enough to make a credit card work, small enough to control initial startup cost), BofA's market share of that population (45%), and relative isolation, to control public relations damage in case the project failed. The 1958 test at first went smoothly, but then BofA panicked when it confirmed rumors that another bank was about to initiate its own drop in San Francisco, BofA's home market. By March 1959, drops began in San Francisco and Sacramento; by June, BofA was dropping cards in Los Angeles; by October, the entire state had been saturated with over 2 million credit cards, and BankAmericard was being accepted by 20,000 merchants. However, the program was riddled with problems, as Williams (who had never worked in a bank's loan department) had been too earnest and trusting in his belief in the basic goodness of the bank's customers, and he resigned in December 1959. Twenty-two percent of accounts were delinquent, not the 4% expected, and police departments around the state were confronted by numerous incidents of the brand new crime of credit card fraud. Both politicians and journalists joined the general uproar against Bank of America and its newfangled credit card, especially when it was pointed out that the cardholder agreement held customers liable for all charges, even those resulting from fraud. BofA officially lost over $8.8 million on the launch of BankAmericard, but when the full cost of advertising and overhead was included, the bank's actual loss was probably around $20 million. One of the former Visa logos, used from 1970 to 2006. However, after purging Williams and his protégés, BofA management realized that BankAmericard was salvageable. They conducted a "massive effort" to clean up after Williams, imposed proper financial controls, published an open letter to 3 million households across the state apologizing for the mess they had caused, and eventually were able to make the new financial instrument work. The original goal of BofA was to offer the BankAmericard product across California, but in 1965, BofA began to sign licensing agreements with a group of banks outside of California. BofA itself (like all other U.S. banks at the time) could not expand directly into other states due to federal restrictions not repealed until 1994. Over the following 11 years, various banks licensed the card system from Bank of America, thus forming a network of banks backing the BankAmericard system across the United States. The "drops" of unsolicited credit cards continued unabated, thanks to BofA and its licensees and competitors, until they were outlawed in 1970 due to the serious financial chaos they caused, but not before over 100 million credit cards had been distributed into the American population. In Canada, an alliance of banks (including Toronto-Dominion Bank, Canadian Imperial Bank of Commerce, Royal Bank of Canada, Banque Canadienne Nationale and Bank of Nova Scotia) issued credit cards under the Chargex name from 1968 to 1977. In France, it was known as Carte Bleue (Blue Card). The logo still appears on many French-issued Visa cards today. In the UK, the only BankAmericard issuer for some years was Barclaycard. In 1970, the Bank of America gave up control of the BankAmericard program. The various BankAmericard issuer banks took control of the program, creating National BankAmericard Inc. (NBI), an independent non-stock corporation which would be in charge of managing, promoting and developing the BankAmericard system within the United States, although Bank of America continued to issue and support the international licenses themselves. By 1972, licenses had been granted in 15 countries. In 1974, IBANCO, a multinational member corporation, was founded in order to manage the international BankAmericard program. In 1976, the directors of IBANCO determined that bringing the various international networks together into a single network with a single name internationally would be in the best interests of the corporation; however in many countries, there was still reluctance to issue a card associated with Bank of America, even though the association was entirely nominal in nature. For this reason, in 1975 BankAmericard, Chargex, Barclaycard, Carte Bleue, and all other licensees united under the new name, "Visa", which retained the distinctive blue, white and gold flag. NBI became Visa USA and IBANCO became Visa International. The term Visa was conceived by the company's founder, Dee Hock. He believed that the word was instantly recognizable in many languages in many countries, and that it also denoted universal acceptance. Nowadays, the term Visa has become a recursive backronym for Visa International Service Association. In October 2007, Bank of America announced it was resurrecting the BankAmericard brand name as the "BankAmericard Rewards Visa". Prior to October 3, 2007, Visa comprised four non-stock, separately incorporated companies that employed 6000 people worldwide: Visa International Service Association (Visa), the worldwide parent entity, Visa U.S.A. Inc., Visa Canada Association, and Visa Europe Ltd. The latter three separately incorporated regions had the status of group members of Visa International Service Association. The unincorporated regions (Visa Latin America (LAC), Visa Asia Pacific and Visa Central and Eastern Europe, Middle East and Africa (CEMEA)) were divisions within Visa. Initially, signed copies of sales drafts were included in each customer's monthly billing statement for verification purposes--an industry practice known as "Country Club Billing". By the late 1970s, however, billing statements no longer contained these enclosures, but rather a summary statement showing posting date, purchase date, reference number, merchant name, and the dollar amount of each purchase. At the same time, many issuers, particularly Bank of America, were in the process of changing their methods of finance charge calculation. Initially, a "previous balance" method was used--calculation of finance charge on the unpaid balance shown on the prior month's statement. Later, it was decided to use "average daily balance" which resulted in increased revenue for the issuers by calculating the number of days each purchase was included on the prior month's statement. Several years later, "new average daily balance"--in which transactions from previous AND current billing cycles were used in the calculation--was introduced. By the early 1980s, many issuers introduced the concept of the annual fee as yet another revenue enhancer. Today, many cards are co-branded with various merchants, airlines, etc. and marketed as "reward cards". On October 11, 2006, Visa announced that some of its businesses would be merged and become a publicly traded company, Visa Inc. Under the IPO restructuring, Visa Canada, Visa International, and Visa U.S.A. were merged into the new public company. Visa's Western Europe operation became a separate company, owned by its member banks who will also have a minority stake in Visa Inc. In total, more than 35 investment banks participated in the deal in several capacities, most notably as underwriters. The law firm Davis Polk & Wardwell served as counsel to the underwriters, while the law firm White & Case LLP served as counsel to Visa Inc. in the global restructuring process. On October 3, 2007, Visa completed its corporate restructuring with the formation of Visa Inc. The new company was the first step towards Visa's IPO. The second step came on November 9, 2007, when the new Visa Inc. submitted its $10 billion IPO filing with the U.S. Securities and Exchange Commission (SEC). On February 25, 2008, Visa announced it would go ahead with an IPO of half its shares. The IPO took place on March 18, 2008. Visa sold 406 million shares at US$44 per share ($2 above the high end of the expected $37–42 pricing range), raising US$17.9 billion in the largest initial public offering in U.S. history. On March 20, 2008, the IPO underwriters (including JP Morgan, Goldman Sachs & Co., Banc of America Securities LLC, Citi, HSBC, Merrill Lynch & Co., UBS Investment Bank and Wachovia Securities) exercised their overallotment option, purchasing an additional 40.6 million shares, bringing Visa's total IPO share count to 446.6 million, and bringing the total proceeds to US$19.1 billion. Visa now trades under the ticker symbol "V" on the New York Stock Exchange. Visa Europe began suspending payments to WikiLeaks on 7 December 2010. The company "said it was awaiting an investigation into 'the nature of its business and whether it contravenes Visa operating rules' - though it did not go into details". In return Datacell, the IT company that enables WikiLeaks to accept credit and debit card donations, announced that it will take legal action against Visa Europe. On December 8, the group Anonymous performed a DDoS attack on visa.com[clarification needed], bringing the site down. Although "[t]he Norway-based financial services company Teller AS, which Visa ordered to look into WikiLeaks and its fundraising body, the Sunshine Press, found no proof of any wrongdoing, Visa Europe announced in January 2011 that "it would continue blocking donations to the secret-spilling site until it completes its own investigation". The United Nations High Commissioner for Human Rights Navi Pillay stated that Visa may be "violating WikiLeaks' right to freedom of expression" by withdrawing their services. Visa's headquarters are located on the top three floors of the 595 Market Street building in San Francisco. As of 2009, 125 people work at the Visa headquarters. The company's center of employment is its campus in Foster City, California, which as of 2009, houses 2,400 employees. Visa had been headquartered in San Francisco until 1985, when it moved to San Mateo. Around 1993, Visa began consolidating various scattered offices in San Mateo to a location in Foster City. Visa's headquarters were in Foster City, and Visa became Foster City's largest employer. Visa owns four buildings at the intersection of Metro Center Boulevard and Vintage Park Drive. As of 2009, before the headquarters move, it employed about 3,000 people at the complex. During that year, Visa signed a 10 year lease agreement for the top three floors of 595 Market Street and moved its top executives there. Visa continued to keep employees at the Foster City offices. 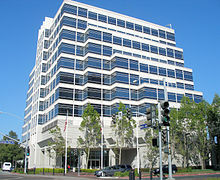 In 2010, SolarCity moved its headquarters to the former Visa offices in San Mateo. Visa also kept its regional headquarters in San Mateo; it occupied a 23-acre (9.3 ha) office complex with six buildings consisting of 270,000-square-foot (25,000 m2) of space, located at California Highway 92 and West Hillsdale Boulevard. In 2007, Interland Family Trust sold the former San Mateo Visa building, now named the San Mateo Office Park, for $86 million to two firms, Lowe and O'Connor Capital Partners. The complex was scheduled to undergo a $16 million renovation. Visa operates the Plus automated teller machine network and the Interlink EFTPOS point-of-sale network, which facilitate the "debit" protocol used with debit cards and prepaid cards. They also provide commercial payment solutions for small businesses, midsize and large corporations, and governments. Visa has a set of rules that govern the participation of financial institutions in its payment system. Acquiring banks are responsible for ensuring that their merchants comply with the rules. Rules address how a cardholder must be identified for security, how transactions may be denied by the bank and how banks may cooperate for fraud prevention, and how to keep that identification and fraud protection standard and non-discriminatory. Other rules govern what creates an enforceable proof of authorization by the cardholder. The rules prohibit merchants from imposing a minimum or maximum purchase amount in order to accept a Visa card and from charging cardholders a fee for using a Visa card. In ten U.S. states, surcharges for the use of a credit card are forbidden by law (California, Colorado, Connecticut, Florida, Kansas, Maine, Massachusetts, New York, Oklahoma and Texas) but a discount for cash is permitted under specific rules. Some countries have banned the no-surcharge rule, most notably the UK and Australia and retailers in those countries may apply surcharges to any credit-card transaction, Visa or otherwise. Unlike MasterCard, Visa does permit merchants to ask for photo ID, although the merchant rule book states that this practice is "discouraged". As long as the Visa card is signed, a merchant may not deny a transaction because a cardholder refuses to show a photo ID. The Dodd-Frank Act allows U.S. merchants to set a minimum purchase amount on credit card transactions, not to exceed $10. Recent complications include the addition of exceptions for non-signed purchases by telephone or on the Internet, and an additional security system called "Verified by Visa" for purchases on the Internet. In September 2007, Visa introduced Visa payWave, a contactless payment technology feature that allows cardholders to wave their card in front of contact-less payment terminals without the need to physically swipe or insert the card into a point-of-sale device. This is similar to the MasterCard PayPass service, with both using RFID technology. In Europe, Visa has introduced the V PAY card which is chip-only and PIN-only. In Australia the major banks, such as the National Australia Bank (NAB), do not allow their customers to opt out of having payWave-enabled Visa cards. The same can be said for Mastercard's contact-less payment systems. Customers who are unhappy with the way payWave permits transactions without the requirement for either PIN or signature have been advised to refrain from having a Visa card attached to their account. The blue and gold in Visa's logo were originally chosen to represent the blue sky and golden-colored hills of California, where the legacy Bank of America was founded. The Visa symbol is used by merchants to denote the acceptance of Visa payment cards. In 2006, Visa removed its trademark flag logo from all its cards, websites and retailer's windows. This was the first time that Visa had changed its logo. The new logo has a simple white background with the name Visa in blue with an orange flick on the 'V' (shown in the infobox at the top of this page). For the new Visa Debit and Visa Electron logo, see the relevant pages. In 1984, most Visa cards around the world began to feature a hologram of a dove on its face, generally under the last four digits of the Visa number. This was implemented as a security feature - true holograms would appear 3-dimensional and the image would change as the card was turned. At the same time, the Visa logo, which had previously covered the whole card face, was reduced in size to a strip on the card's right incorporating the hologram. This allowed issuing banks to customize the appearance of the card. Similar changes were implemented with MasterCard cards. In March 2009, Visa launched its first global advertising campaign: "More people go with Visa." The new campaign enabled Visa to align marketing worldwide under a single theme that could be executed locally for maximum relevance and impact and highlight how Visa differs from standard cash and checks in security, control, and convenience. Since its launch, Visa has used the platform to create customized campaigns in support of its sponsorship properties including the Olympic Games and FIFA World Cup. In 2010, Visa introduced first-ever global campaigns in support of both the Vancouver 2010 Olympic Winter Games ("Go World") and 2010 FIFA World Cup South Africa ("Go Fans"). Advertising creative from the Go Fans campaign was customized and appeared in 30 markets around the world to strengthen the campaign’s relevance in those regions. In October 2009, Visa launched Currency of Progress, an effort to better educate the world about how digital currency advances economic empowerment and business efficiency worldwide. Through real-life testimonials, Currency of Progress illustrates how the migration from cash and checks to electronic payments helps individuals access their money more securely and conveniently; builds stronger, more efficient businesses; and enables governments to be more cost-effective and responsive to their citizens. The website contains the campaign’s video testimonials, fact sheets on key areas such as security, government efficiency, financial literacy, innovation, and merchant benefits, along with real-world case studies. Visa extended its partnership with the International Paralympic Committee through 2012, which includes the 2010 Vancouver Paralympic Winter Games and the 2012 London Paralympic Games. In 2002, Visa became the first global sponsor of the IPC. Visa is currently the shirt sponsor for the Argentina national rugby union team, nicknamed the Pumas. Also, Visa sponsors the Copa Libertadores and the Copa Sudamericana, the most important football club tournaments in South America. Until 2005, Visa was the exclusive sponsor of the Triple Crown thoroughbred tournament. Visa sponsored the Rugby World Cup, and the 2007 tournament in France was its last. In 2007, Visa became sponsor of the 2010 FIFA World Cup in South Africa. The FIFA partnership provides Visa with global rights to a broad range of FIFA activities - including both the 2010 and 2014 FIFA World Cup and the FIFA Women's World Cup. Since 1995, Visa has sponsored the U.S. NFL and a number of NFL teams, including the San Francisco 49ers whose practice jerseys display the Visa logo. Visa's sponsorship of the NFL currently extends through the 2014 season. Visa sponsored PacWest Racing's IndyCar team in 1995 and 1996, with drivers Danny Sullivan and Mark Blundell respectively. Visa Inc.'s former headquarters in Foster City, California, is still home to a significant portion of the company's operations. Visa settled an antitrust lawsuit brought by a class of U.S. merchants, including Wal-Mart, for billions of dollars in 2003. According to a website associated with the suit, Visa and MasterCard settled the plaintiffs' claims for a total of $3.05 billion, and Visa's share of this settlement is reported to have been the larger. In October 2010, Visa and MasterCard reached a settlement with the U.S. Justice Department in another antitrust case. The companies agreed to allow merchants displaying their logos to decline certain types of cards (because interchange fees differ), or to offer consumers discounts for using cheaper cards. In December 2010, Visa reached a settlement with the European Union in yet another antitrust case, promising to reduce debit card payments to 0.2 percent of a purchase. A senior official from the European Central Bank called for a break-up of the Visa/Mastercard duopoly by creation of a new European debit card for use in the Single Euro Payments Area (SEPA). After Visa's blocking of payments to WikiLeaks, members of the European Parliament expressed concern that payments from European citizens to a European corporation could apparently be blocked by the US, and called for a further reduction in the dominance of Visa and Mastercard in the European payment system. ^ a b c d e f "2010 Form 10-K, Visa Inc.". United States Securities and Exchange Commission. http://www.sec.gov/Archives/edgar/data/1403161/000119312510265236/d10k.htm. ^ Visa. Retrieved March 26, 2010. ^ The Nilson Report December 2009. ^ Q1 FY2010 Quarterly Earnings, February 3, 2010. ^ Visa Opens New Data Center in the U.S., Nov. 16, 2009. ^ "History of Visa". http://corporate.visa.com/about-visa/our-business/history-of-visa.shtml. Retrieved 9 February 2011. ^ Joseph Nocera, A Piece of the Action: How The Middle Class Joined the Money Class (New York: Simon and Schuster, 1995), 23. ^ a b c Nocera, 24. ^ a b Nocera, 31. ^ "History of Visa", Visa Latin America & Caribbean. ^ The Unsolicited Credit Card Act of 1970 amended the Truth in Lending Act of 1968 to ban the mailing of unsolicited credit cards. It is now codified at 15 U.S.C. § 1642. ^ "BofA resurrects Bankamericard brand", San Francisco Business Times. ^ Visa, Inc. Corporate Site. ^ "Visa plans stock market floatation", BBC News - Business, October 12, 2006. ^ Bawden, Tom. "Visa plans to split into two and float units for $13bn. ", The Times, October 12, 2006. ^ Bruno, Joel Bel. "Visa Reveals Plan to Restructure for IPO", Associated Press, June 22, 2007. ^ "Visa, Inc. Complete Global Restructuring", Visa, Inc. Press Release, October 3, 2007. ^ "Visa files for $10 billion IPO", Reuters, November 9, 2007. ^ "Visa plans a $19 billion initial public offering". The Economist. February 25, 2008. ^ Benner, Katie. "Visa's $15 billion IPO: Feast or famine? ", Fortune via CNNMoney, March 18, 2008. ^ "Visa Inc. Announces Exercise of Over-Allotment Option", Visa Inc. Press Release, March 20, 2008. ^ "Visa IPO Seeks MasterCard Riches", TheStreet.com, February 2, 2008. ^ BBC News. Retrieved December 8, 2010. ^ "Wikileaks' IT firm says it will sue Visa and Mastercard". BBC News. 2010-12-08. http://www.bbc.co.uk/news/business-11945875. Retrieved 2010-12-08. ^ UNifeed Geneva/Pillay, UN Web site. Retrieved on 15 December 2010. ^ a b "Week in review." The Daily Journal. January 3, 2009. Retrieved on February 2, 2011. ^ "Visa joins The Chronicle 200 at No. 20." San Francisco Chronicle. April 19, 2009. Retrieved on February 2, 2011. ^ a b "Visa finds a passport to the future San Mateo Company bets on 'SMART' cards that will exchange information, not just money." San Jose Mercury News. Monday August 7, 1995. 1F Business. Retrieved on February 2, 2011. "Visa's headquarters remained in San Francisco until 1985, when it relocated to San Mateo. Then, two years ago, it began consolidating scattered sites throughout San Mateo in nearby Foster City with [...]". ^ "SolarCity to move HQ, double its space." San Francisco Business Times. Sunday August 22, 2010. Last modified on August 19, 2010. Retrieved on February 2, 2011. ^ Hollis, Robert. "Former Visa office park in San Mateo sold." San Francisco Chronicle. 1. June 12, 2007. Retrieved on February 2, 2011. ^ "Synovus Selects Visa's Plus and Interlink as Primary Debit Network Providers", AllBusiness, April 6, 2004. Retrieved July 2, 2010. ^ a b c "Visa Rules for Merchants", Orion Payment Systems, Retrieved July 2, 2010. ^ "Statuatory Instrument 1990 No. 2159: The Credit Cards (Price Discrimination) Order 1990. ", UK Office of Public Sector Information, October 31, 1990. ^ "Different pricing for different payment methods (credit cards vs. cash). ", Australian Competition and Consumer Commission. ^ "New Visa payWave Issuers and Merchants Sign Up for Faster, More Convenient Payments". http://www.smartcardalliance.org/articles/2007/09/20/new-visa-paywave-issuers-and-merchants-sign-up-for-faster-more-convenient-payments. ^ "V PAY - your European debit card". http://www.vpay.com/banks.html. ^ "Hot Topic: A Brand Evolution. ", Visa Corporate Press Release, January 2007. ^ "Card Security Features. ", Visa Canada Web Site. ^ "Visa Check/MasterMoney Antitrust Litigation", Web Site. Wikimedia Commons has media related to: Visa Inc. This page was last modified on 9 September 2012 at 01:51.